Starting with knees just shy of locked, I hit a 2 second, full-on / balls out, isometric contraction. Then, at t=0, I’m forced into an eccentric contraction. Think “trash compactor”; my back is fixed and the plate on which my feet are placed is coming at me at a fixed rate. I cannot stop the plate, and no matter how much force I apply, the plate continues to move at a fixed rate. The y axis represents instantaneous force output (ft-lbs torque), the x axis, time (in seconds). The top of that green band represents my instantaneous max force production. The bottom of the green band is 40% of that value. The trough (at t=9) represents force production at my most limited position. Another way to think of that is representing the max load I’d be able to handle in a conventional exercise. Yeah, let that last statement sink in for a moment. If there’s a drawback to conventional barbell / dumbbell work, it’s illuminated here. – at t=3, I’m at my biomechanic strongest position; knees at a slight flex (10-ish degrees? ), in the eccentric. – at t=9, I’m at my most limited position; what would be well below parallel in a squat. I’m in a bout a half second isometric here. Then the plate reverses direction and I begin the concentric back to full knee extension. Again, the rate is fixed, no matter how much force I generate. – t=17 represents my max concentric force output. – that dip at t=13 is (a) the result of some fatigue build up and (b) where my right knee (still undergoing rehab from a sprinting incident) is at it’s wonkiest. Ok, keep that in mind as we dive into the following! Six years ago I wrote this article discussing the “perfect rep”or, more to the point, highlighting what I thought was a very good T-Nation article on the same. ARXFit was rather in it’s infancy at that time and, while I still agree with what I wrote in that article, I realize now, after the subject resurfaced in a recent conversation, that a couple of things are missing. First off, I failed to mention the contribution of Fred “Dr. Squat” Hatfield’s Compensatory Acceleration Training (CAT). I also failed to mention the HUGE advantage that ARXFit technology lends to the practice of maximum force development throughout the entire range of motion via intended acceleration of the concentric. If you’re applying a thousand pounds of force at the bottom of the lift and then as leverage improves you continue to apply a thousand pounds or less, you’re not accomplishing as much as you can. Instead, you’ll see that as leverage improves you’re able to apply twelve hundred pounds of force, fourteen hundred pounds of force up near the top. The secret though is that you’re applying as much force as you possibly can exert all the way through the lift. That means you’re spending more time under maximum tension. That means you’re going to make progress much faster than you could otherwise, probably twice as fast. So we can all agree on the importance of, and why you’d want to work the eccentric portion of the movement. If for any reason that’s unclear, checkout this post for a short eccentric primer. But the concentric portion of the lift is vitally important, too — just for different reasons; some of which are covered, here, in this excellent Kabuki Warrior piece. And diabetics, for instance, could use concentric-only training to clear vast amounts of glucose from the system without undue resultant soreness that would otherwise dissuade them from training at all. But what I’d like to hone-in on here is the opportunity to create (via an intended, fast-as-possible concentric), extreme force output and improved CNS (central nervous system) stimulation. 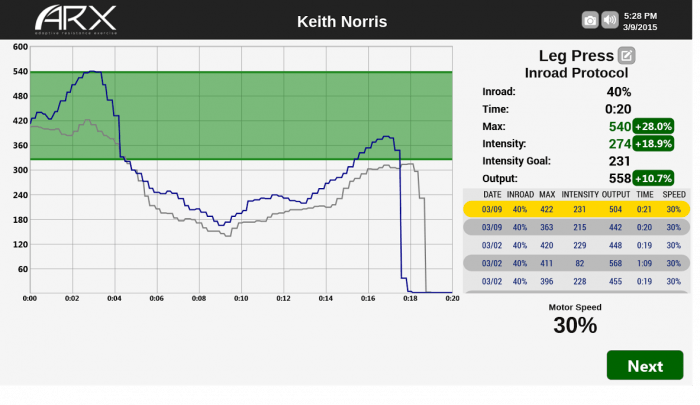 In essence, ARXFit technology allows for perfectly-matched “compensatory acceleration”. Better, in every way, from free weight alone OR load in addition to chains, bands, weight releasers… well, anything that’s gravity based. In fact, my (primary) beef with Super Slow methodologies would be eliminated if we were able to incorporate the intent to move fast on the concentric portion of the movement. The very nature of the intent to move fast prevents “dumbing-down” of the CNS. The CNS, just like any other aspect of human performance, responds accordingly to the stimulus given. The last thing you’d want to do is train in a slow and controlled concentric. Unless, of course, you’re worried about safety issues. And we’ll get to that in a moment. That one must train fast to be fast is an ages-old S&C axiom. Admittedly, it’s a disputed notion that the CNS can, in fact, be “dumbed-down” with improper training methods. I would, however, put “train slow / perform slow” at the very top of my “what I believe to be true but cannot prove” list. That and, the notion that the CNS can be honed via smart training (including “explosive” concentrics). Now, I get that most people are not athletes and, as such, are not too terribly concerned with a finely tuned CNS. I get that most people are concerned, however, with safety and that explosive, “fast-as-possible” concentric motions present valid safety concerns. But what if I told you that a technology now exists for a trainee to explode through the concentric portion of a movement in a perfectly safe manner? And, in doing so, you just might help prevent (via a “snappy” CNS) a misstep fall — say, from from a curb, or any other trip hazard. I’ve yet to see a slow-and-controlled recovery from that kind of happening. So in that sense, everyone is an athlete. So what does a safe, explosive concentric look like? Check out Ben Greenfield at the 58 second mark in this clip. Lets not forget that the ARX can bridge the gap on those who simply don’t know how to push hard. Agreed. And a good point. It’s fun to watch people learn how to exert real force — in a safe way. With no fear of pending doom from a failed lift and crashing weight. I’m not a young man anymore but I do hope to see the day when all people fully understand the importance of what ARX offers. Simply stated ARX is the perfect tool for performing all protocols perfectly.